Overview of Community Characteristics in Areas With Concentrated Poverty. Researchers most often define concentrated poverty as a significantly high proportion of areas residents living below the poverty level. consistent with the threshold in much of the concentrated poverty literature. The second criterion which must be met for the area to meet our definition as one of concentrated poverty is that a Census tract with poverty rate of 40 percent or higher must be located in a ZCTA where at least 30 percent of residents are poor. For this research, we refer to areas of concentrated poverty as “30/40 ZCTAs” – or ZCTAs with poverty rates over 30 percent that contain at least one Census tract with at least a 40 percent poverty rate. There are 690 ZCTAs that meet these criteria in the 2011 American Community Survey 5-year file.3 Within these 690 ZCTAs are 1,845 Census tracts with poverty rates above 40 percent (see Table 1). This represents 58 percent of all Census tracts with poverty rates exceeding 40 percent. Using this definition of concentrated poverty, roughly 12.8 million people, or four percent of the U.S. population, lived in 30/40 ZCTAs and about 35 percent of residents in these areas had incomes below the poverty line. About one in ten of America’s 42.7 million poor people lived in one of these neighborhoods 2009. Almost all of these individuals lived in metropolitan areas (i.e., central city or adjacent suburbs). The distribution of America’s poor population is spatially uneven, and impoverished individuals, particularly those who live in areas of highly concentrated poverty, are overrepresented in inner-city urban areas, tribal reservations, and certain isolated rural regions. Each of these settings is unique, with distinct implications for possible poverty-alleviating interventions. This brief focuses on the demographics and community characteristics of the 531 high-poverty ZCTAs that are in metropolitan (urban and suburban) areas, most of which are in the central cities of their metropolitan areas. 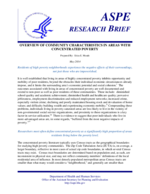 Later briefs will cover the unique characteristics of rural and tribal areas of concentrated poverty. 1 There are roughly 33,000 ZCTAs with an average population of 9,050 and populations ranging from 30 to 114,000. There are 74,000 Census tracts with an average population of 4,090 and a population range of 1,200-8,000. 2 With the caveat that nothing is perfect, by using the ZCTA as the geographic unit of analysis, we identify characteristics using a larger geography that may more closely resemble a service delivery area and is more convenient for aligning data on area needs and services. 3 Although 691 ZCTAs met the criteria outlined above, one of those areas has a population of only 75 and is the site of a Veteran’s Affairs Health Center, so it was excluded from the analysis.